In a situation where you need some sort of duplicate message check for an Oracle Service Bus project you would need some custom code. Since the Oracle Service Bus is stateless, when it handles a proxy service call it will not know if this specific message was handled before. So there needs to be some sort of logic in your service for validating it’s a new unique message id. Giving the fact that every message on our ESB has an unique messageID element in the SOAP header we could store this on disk, database or in memory. With the help of Oracle Coherence this last option, in memory, is relatively simple. remark: However these changes mentioned above (either disk, database or coherence) makes your stateless OSB a bit more statefull. Be carefull as developer or architect when you encounter requirements like these. The OSB wasn’t designed as a fast and stateless message handling ESB for nothing. We use this mechanism in a process flow with low message load where an old mainframe system with a custom (old) adapter occasionally (and unwanted) triggers duplicate messages. So in our case memory load is not a huge issue and we can proceed with our default monitoring tools). These few lines of code (ab)use the Coherence memory cache to store the XML message element MessageID as the Key and stores the element timestamp of the XML message as value. You could also store correlationID, or any other element, which might not be unique but this is not an issue for the Coherence values as long as the key is unique. The fact I use timestamp is to be able to create an overview of old messages (and maybe delete old keys with an additional Java method). Input for the callout are these 2 elements from our custom soap header. The result boolean variable is checked in the IF-THEN action. If TRUE then the proxy will throw an error because the message is a duplicate already passed earlier on. Remind yourself that by default we are using the default Coherence caching strategy which means we store these cache entries in the default Weblogic JVM which hosts the Oracle Service Bus services, messages, transformations, jdbc connection & jms modules. To protect your JVM you can use an external coherence server which is explained by William Markito Oliveira in his blog on OTN. I really love the fact how Oracle integrated Coherence into OSB by extending the Business Service capabilities to use result caching (see blog from Mark Smith if you don’t know this feature). The code used in this blogpost is not rocket science and I hope to see features like this out-of-the-box in future upgrades of the Oracle Service Bus. thanks for the post, helped me with exactly the same customer question ;-) I have an improvement to reduce the time between lookup and put. 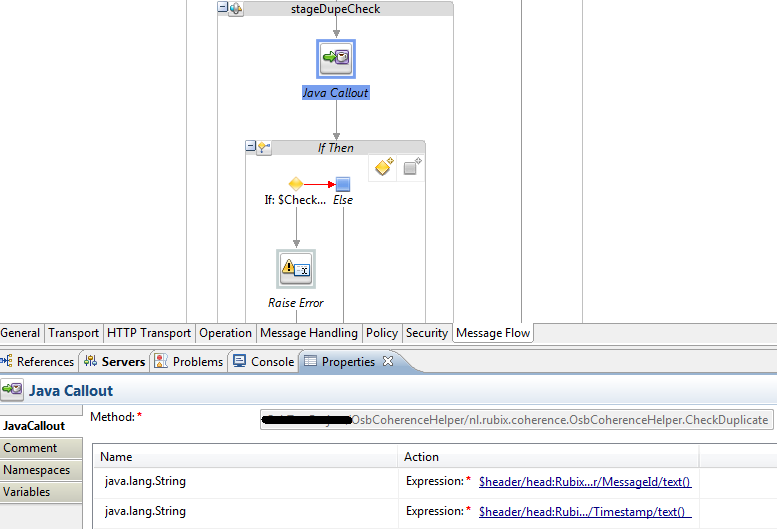 Use directly put and check the return value, which is “old” object if already in the cache. And “null” if the object is new. probably i have a really simple question how could i address the default cache used from Oracle Service Bus, if i use your code it seems to get a new instance of the Coherence cache.